The Soul of San Luis features the works of three Colorado artists with deep ties to the state's historic valley: Peter Marchand, Josie Lobato, and Marc Shereck. This is a more expansive exhibit of an original show that hung this year at UCCS. 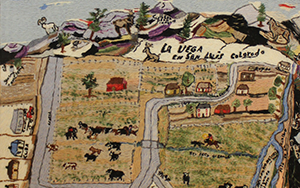 The show features Lobato's colchas, wool-embroidered coverlets, which depict life in the San Luis Valley from the sacred aspects, such as the journey of the Penitentes; to the mundane, such as harvests.